The solubility of a substance in a liquid is determined by the interactions that take place between the molecules, and by entropy effects. That is, for a solution process to take place, the free energy of the system must decrease. The free energy change depends upon the enthalpy change, which at constant pressure is the heat associated with changes in the various interactions involved (bond energies, dipole-dipole interaction energies, etc. ), and upon the entropy change that can be regarded as a measure of the change of order, or degrees of freedom. The processes involved in dissolving one substance in another are disruption of solute-solute interactions, at least partial disruption of solvent-solvent interactions caused by the presence of solute molecules, and formation of solvent-solute interactions. The first two of these involve absorption of heat (endothermic). The change in enthalpy will be favorable for solution only if the solvent-solute interactions, which are exothermic, are larger in magnitude than the other interactions. In the case of water, large solvent-solute interactions can arise only through H-bonding, coordination, ion-dipole attractions, or perhaps dipole-dipole attractions. Solute molecules not able to interact in one of these ways will not interact strongly with the water molecules. Because of these factors, there is a general tendency for like substances to dissolve in one another, and for unlike substances not to do so. Water provides an example of this tendency; it is generally a good solvent for ionic and highly polar (especially hydrogen-bonding) substances, but poor for nonpolar substances such as hydrocarbons. The increase in entropy on mixing is always a driving force toward solubility, although it may be largely outweighed by energy effects in some cases. The foregoing considerations are valid as a qualitative guide to the type of solubility behavior to be expected. However, a prediction of poor solubility does not necessarily mean no solubility at all. Substances may be important environmentally at very low levels of solubility, so that even if a material is described as "insoluble," its presence in aquatic systems cannot be dismissed. Concentrations in the parts-per-million (ppm) or even parts-per-billion (ppb) range may be significant for some pollutants, and solubilities to this level will be found for most substances. Further, the distinction between dissolved and suspended matter is not always clear cut. Very finely divided particulate matter (colloids) that settle or coagulate very slowly may pass through most filtering systems. The surface areas per unit mass of such material will be very high, so that its reactivity may be much greater than that of the bulk solid. where C represents concentration in appropriate units, such as moles per liter. Solubility of a gas is usually small unless a reaction with the solvent is involved, and in most cases it decreases with increasing temperature. The pressure dependence of gaseous solubility is well known from the release of carbon dioxide from pressurized carbonated beverages when the container is opened. 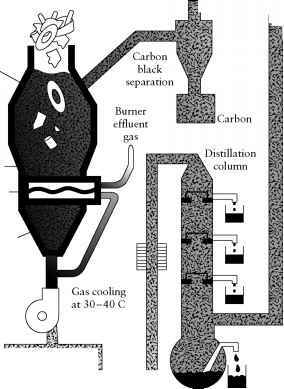 It is also well known from this experience that release of the gas is not instantaneous, but is accelerated by agitation, which aids in the nucleation step in the formation of the gas bubbles. An environmental analogue is found in some deep crater lakes in Cameroon. Since these lakes are tropical, there is no seasonal turnover to mix the upper and lower levels and they can be highly stratified. The lower levels of some of these lakes contain concentrations of carbon dioxide, either from decaying vegetation or, more likely, from geological seepage, that are far greater than equilibrium values at surface pressures. In August 1986 about 1700 people were killed by suffocation from carbon dioxide released when one of these lakes, Nyos, "turned over" in response to some physical stimulus3 (perhaps earth movements, perhaps wind effects, although a volcanic eruption also was proposed). Thirty-four people in the same country died in 1984, when a similar phenomenon occurred in Lake Monoun. The equilibrium solubility depends on the concentration of the ions from all sources and will be modified by competing reactions that involve these ions. 3R. A. Kerr, Nyos, the killer lake, may be coming back, Science, 244, 1541 (1989). Also, see Volume 39 (1989) of Journal of Volcanology and Geothermal Research, which contains a number of papers on the Lake Nyos event. More recently, experiments aimed at degassing the lake by inserting a 200-m-long pipe to the bottom were carried out. A self-powered jet of water results that releases 10 liters of CO2 per liter of water. Expansion of this process is planned, in spite of some concerns that it might destabilize the lake sufficiently to cause another sudden overturn. It will be the convention in this chapter to use square brackets to represent the equilibrium concentration of a species, while C, with a suitable subscript, will be used to represent analytical or total concentrations of substances that exist in solution as one or more species. Nonionic solids or liquids will also have an equilibrium solubility, but these are not generally treated by the equilibrium constant approach. Solubilities in general may range from very small to infinite. In environmental situations, normally one is dealing with low concentrations, and consequently, equilibrium considerations will be of concern only with slightly soluble substances. The equations used in equilibrium expressions in this book are written in terms of concentrations rather than activities. The activity ai of species i in solution of concentration Ci is where yi is the activity coefficient of the substance. In effect, yi is the factor by which the actual concentration must be multiplied to maintain the validity of the thermodynamically exact equations. The activity coefficient yi may be greater or less than unity, depending on both the concentration Ci and the nature and concentration of other species in the solution. Because yi ^ 1 as Ci ^ 0, use of concentrations in dilute solutions is acceptable for most purposes and necessary in most environmental problems, where activities generally are not known. Some care must be exercised, however, as with seawater, which contains roughly 0.5 M NaCl in addition to other components and cannot be considered to be a dilute solution in this context. The presence of a relatively large concentration of an "inert" salt such as NaCl produces nearly constant values for the activity coefficients of ions present in small amounts, such as H30+, although these values may be far from unity. Equilibrium constant expressions will give correct results in this case, but only for an equilibrium constant having a value different from that applicable to the dilute solution case. Equilibrium constants valid for a solution of a particular overall composition are sometimes called stoichiometric equilibrium constants. Although these thermodynamic relationships will permit calculation of equilibrium concentrations, it must be remembered that many natural systems will not be at equilibrium because of kinetic factors. Supersaturation may occur because of difficulty in forming the initial nuclei on which the particles may grow. Surface ocean water, for example, is supersaturated in calcium carbonate. The process of dissolution also may be slow, so that undersatura-tion even in the presence of excess undissolved material may persist. Finally, in natural systems, interactions with other materials in solution may have large effects.